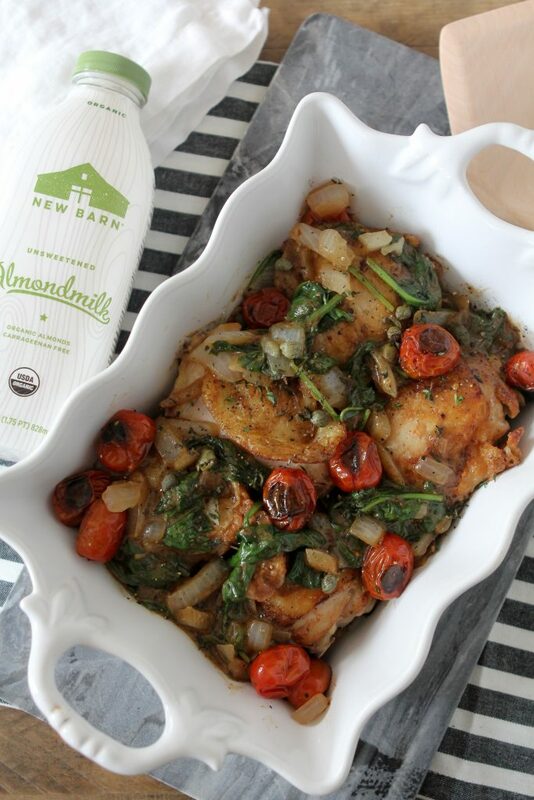 This Creamy Mustard Chicken + Spinach from The Whole Smiths is brought to you in collaboration with New Barn Organic Almondmilk. 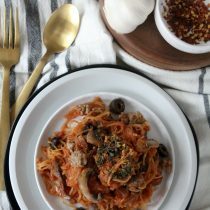 Not only is this decadent dish paleo and dairy-free but it’s also Whole30 compliant. Sometimes a recipe comes along and I’m like, “Whoaaaa Nelly, the people are gonna love this one!”. Hold up, I take that back. I don’t really think that exactly and I don’t obnoxiously refer to anyone as “the people” and I’m not sure who Nelly actually is. Certainly not the world famous, St. Louis based Nelly. 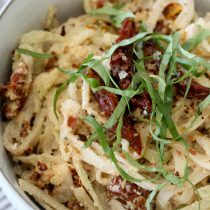 But it just doesn’t sound nearly as cool to say, “Wow, I think this recipe will be a real crowd pleaser that will tantalize people’s palates and make them realize this clean eating bit isn’t so bad after all”. That’s a mouthful and I don’t really talk like that either though. 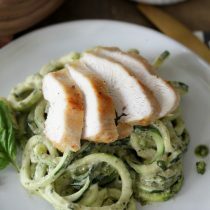 The main sentiment is that, I think you’ll really love this Creamy Mustard Chicken + Spinach recipe. It’s delicious and you’ll forget that it’s chock full of minimally processed, whole ingredients. 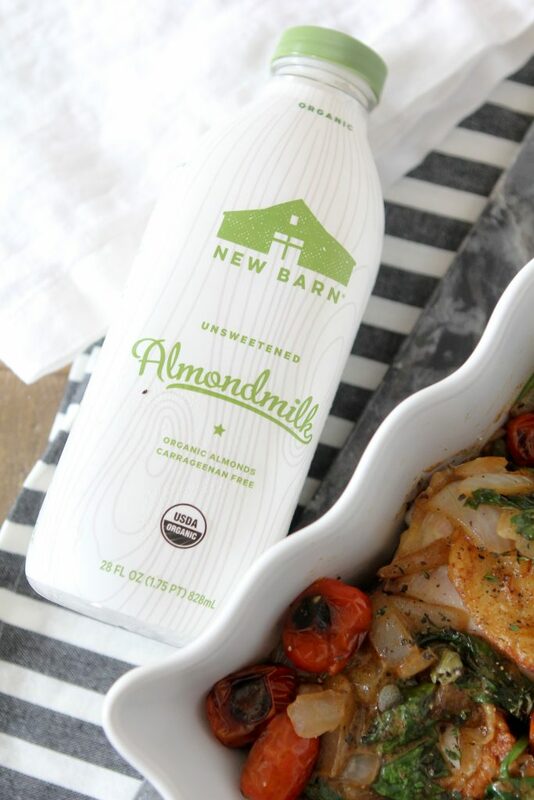 Adding New Barn Organic Almondmilk brings just enough creaminess to the sauce that you’ll want to soak it all up. When I first started incorporating more healthy choices into my diet, it was daunting. I was just where you were or are starting your journeys. I found myself constantly focused on all of the things I had to give up rather than all of the new foods I would be eating. No more ice cream, no more grilled cheese, no more creamy ANYTHING. In fairness, I think that’s quite common. If you find yourself in that same boat, know that you aren’t alone. It’s all about the benjamins substitutions. I’m bringing creamy back! Yep. Something else I neglected to think about was all of substitutions I could be making to bring back some of the textures or flavors that I was missing. The creamy, the crunchy, the sweet. I mean, not everything was going to have to be cauliflower based from here on out, right? Cauliflower is magical and all but I needed some variety on my plate. Once we start limiting our dairy intake we start to realize just how much dairy is in what we’re consuimg. From our morning coffee to the cheese on our lunchtime sandwiches, the bottle we give our little ones and the cream sauce smothered all over our pasta. Oh, and I can’t forget ice cream. It’s that creamy consistency that brings something special to all of those. Therefore, the good news is that it’s quite easy to recreate that creaminess and incorporate it into many recipes. Typically when someone weans off of traditional dairy they gravitate towards coconut or nut based milks like almond milk. While I don’t mind using coconut milk for select recipes that will fit a coconut flavored profile (like a curry) I find the coconut flavor to be a bit prohibitive in most recipes. 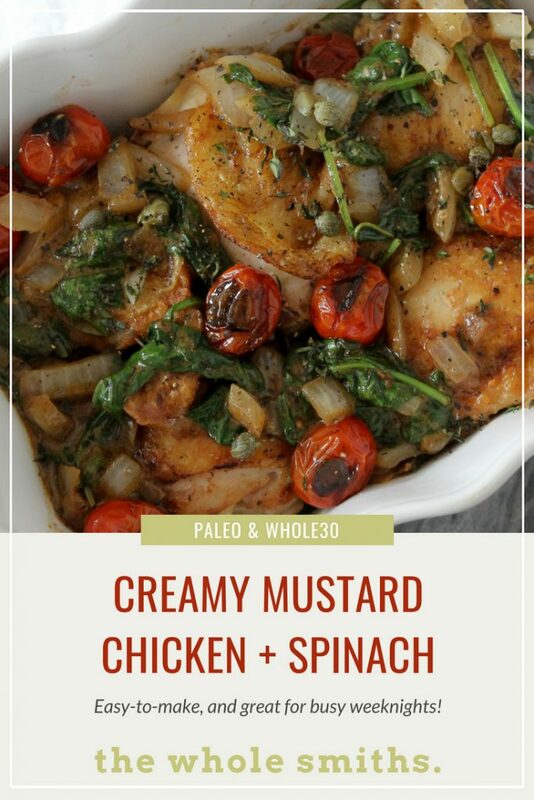 For example, the coconut milk would be much too strong for what I was looking for with this Creamy Mustard Chicken + Spinach recipe. Because of that, I use almond milk as a swap in most recipe that call for milk. With that said, not all almond milks are created equal. Many are laced with artificial stabilizers, thickeners and emulsifiers. Fortunately for us, New Barn not only makes organic almond based milks but they are free from all of those nasty ingredients. And wouldn’t you know, their Unsweetened variety is just almonds, water, acacia gum and sea salt. Like almond milk is supposed to be! Most importantly, New Barn packs in way more almonds into their beverages. Therefore, that means more flavor and more protein for you. Once you get in the habit of reading your labels you start to realize that not every “healthy” product is indeed whole and good for you. So when you’re looking to add a bit of “creamy” back into your recipes read those labels! Some of the other recipe that I’ve used New Barn to bring some creamy back into is my Whole30 Green Magic Sauce and my Dairy-Free Blueberry + Lemon Float. Chicken. It’s what’s for dinner. 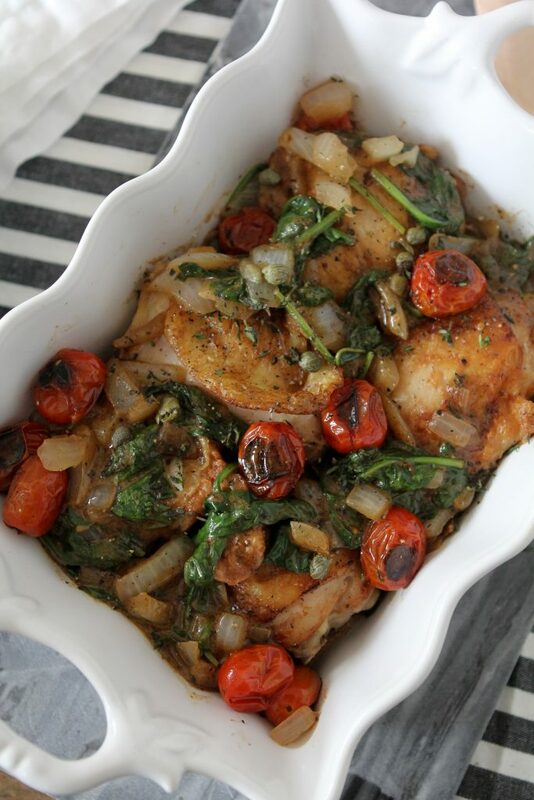 This chicken is a breeze to whip up during busy nights. It’s going to leave you full and wanting more. While the flavors reheats well for leftovers just know you won’t retain that crispy chicken skin the second time around. 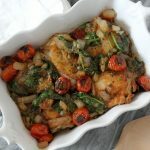 Know that I have successfully reheated these chicken thighs in a skillet skin-side down to revive that crispy skin but by the time I heated in in the microwave and fired up the pan it defeated the purpose of having quick, reheatable leftovers on hand. 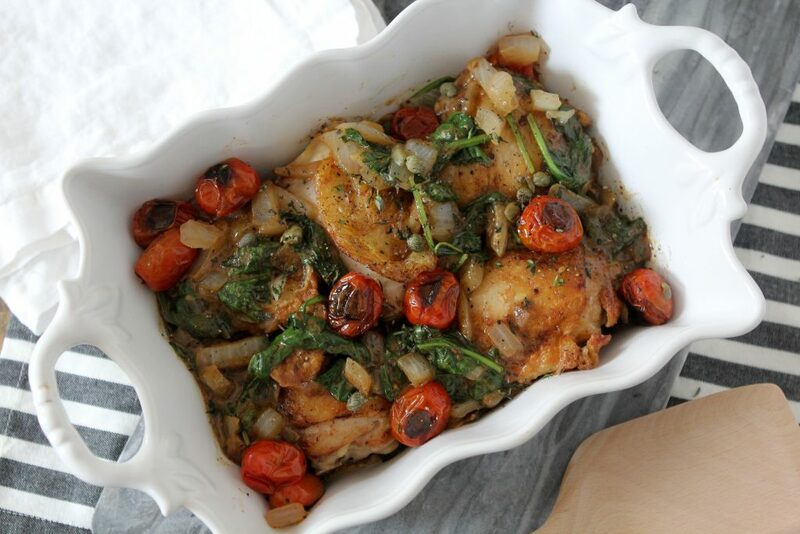 While you can serve this Creamy Mustard Chicken + Spinach dish stand alone, I always like adding even more veggies and produce to our plates. Finally, I love serving it with some mashed potatoes or my Gremolata Green Beans. What are some recipes that you love adding some creaminess back into? Heat a separate frying pan (or cast iron skillet over high heat). Once the pan is hot add 1 teaspoon on the olive oil and the cherry tomatoes. Let the tomatoes sit still in the pan for one minute, letting the skins char. Gently stir the tomatoes and cook for an additional 2 minutes until the other sides of the skin have charred. Set aside. Heat a large frying pan or dutch over over medium high heat and add 1 tablespoon of the oil. Once the oil is hot, add the onions and cook for 5-6 minutes, stirring frequently, until the onions are tender. Using a slotted spoon, remove the onions from the pan handset aside. Season the chicken thighs with the 2 teaspoons of salt, evenly sprinkling the salt over it. Add the remaining tablespoon of oil to the large frying pan / dutch over and heat over medium high heat. Once the oil is hot, add the chicken thighs SKIN SIDE DOWN onto the pan. Let the skin cook and crisp for roughly 5 minutes until it is crispy and golden brown, do not flip the chicken during this time. Reduce the heat to medium and continue to cook for an additional 7-9 minutes. Flip the chicken and continue to cook the chicken for an additional 13-15 minutes and it has reached an internal temperature of 165*. 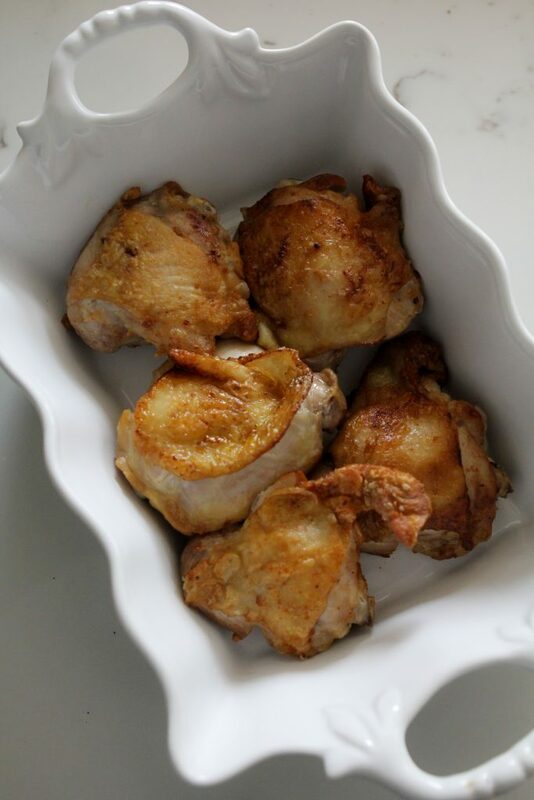 Remove the chicken from the skillet onto a paper towel lined plate and set aside. Drain the excess cooking fat from the skillet leaving about 2 tablespoons of liquid in the pan. Reduce the heat to medium low and add the chicken broth to the skillet. Stir the broth with a wooden spoon, gently scraping up any remaining bits off the pan. Then add the dijon mustard and champagne vinegar and stir well to incorporate it. Add the arrowroot powder and 1 tablespoon of water to a small bowl and stir until it is incorporated and smooth. Slowly drizzle the arrowroot mix into the mustard mix, constantly stirring as you drizzle it in. Pour the almond milk in and continue to stir. Add the spinach and capers to the pan and cook until the spinach has wilted, about 2-3 minutes. Finally, add the tomatoes back into the pan and stir. Salt to taste. 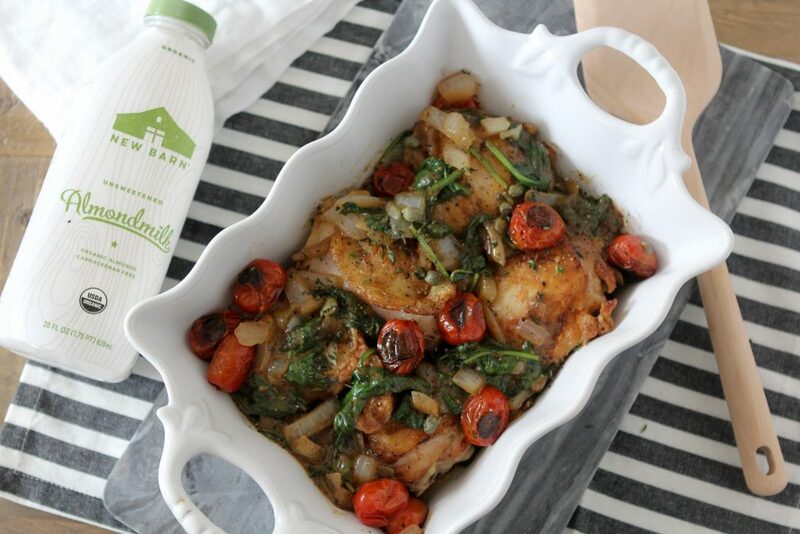 To serve, plate the chicken thigh and pour the creamy mustard sauce and spinach over top. I love this recipe. Thank you so much for sharing! Sounds so delicious. Wondering… how “mustard-y” does this taste?